Rabbi Dr Harvey Belovski is senior rabbi of Golders Green Synagogue and Chief Rabbinic Consultant. Rabbi Belovski graduated in maths from Oxford University, gained semichah from Gateshead Yeshivah and holds postgraduate degrees from the University of London (PhD: hermeneutics) and City University (MSc: Organisational Psychology). 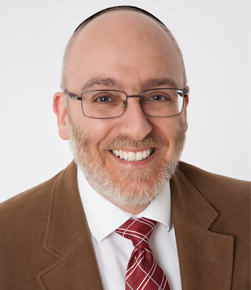 He is principal of Rimon Jewish Primary School, head of modern rabbinic thought at the London School of Jewish Studies, rabbi of Kisharon, faculty member at the London Montefiore rabbinical training school and a guest lecturer at Kings College, London. Rabbi Belovski is engaged in interfaith and community cohesion projects and is a faculty member of the Senior Faith Leadership Programme, St George's House, Windsor. He is a board member of the charity HOPE not hate, an accredited civil and commercial mediator, the author of three books, a regular live broadcaster on the BBC Radio 2 Chris Evans show and a popular speaker in the UK and internationally. His special interests include midrashic interpretation, contemporary halachah, pre-marriage counselling, 19th-century European Jewish thought and the development of independent-minded students. Rabbi Belovski met his wife Vicki when they were students at Oxford; they are the proud parents of seven beautiful children. How Do You Work Out Shabbat Times? Why can't Ashkenazi Jews eat Kitniyot (Beans, Rice or Pulses) on Pesach? Everyone knows that we eat Matzah on Pesach. But what is Shemura Matzah? Rabbi Harvey Belovski of Golders Green United Synagogue explains. Why Do We Sell Our Chamtetz Before Pesach? Rabbi Harvey Belovski of Golders Green United Synagogue answers the question of why we sell our chametz products to non Jews before Pesach. Why Do We Stay Up All Night Learning on Shavuot?